Contact Katie about Restorative Yoga, Grief Yoga and healing forest hikes. Hey there, I’m Katie Van Den Berg, owner of Peaceful Pine Wellness. I’m on my own journey to find peace in my life and I’m grateful your compass lead you here. Peaceful Pine Wellness is a culmination of my life’s journey through healing, nurturing my body, creating self-love and positive body image, rediscovering my inner strength, and finding peace in a busy world. I started this journey, like I’m sure you did, because I was in pain emotionally, and physically burnt out. I was craving more out of life. I was craving healing, peace, happiness and strength, and a deeper connection with the natural world and myself. As a teenager my journey led me to yoga, hiking, singing, expressive arts, and thus started my transformational path to wellness and DevaTree School of Yoga. Peaceful Pine Wellness offers wellbeing services through healing paths with yoga, mindfulness, meditation, hiking and nature connections, so you can rediscover wellness, find your footing and breathe again. Because we could all use a compass to journey through life’s uneven terrain. 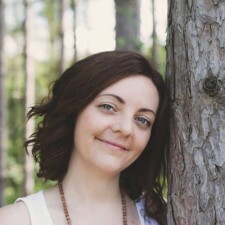 Katie is Registered Yoga Teacher RYT-500, who specializes in restorative yoga, hatha yoga, grief yoga and meditation. With Katie’s calm and grounding presence, it isn’t a surprise that she has strong connection to nature and the outdoors, where she finds peace and balance. Katie shares her passion for healthy living, trees, and forest bathing (mindful forest walks) as a Certified Hike Leader, as well as volunteers with the Thames Valley Trail Association, ReForest London, and Growing Chef’s Ontario. Her favourite tree is the white pine It is the largest of the conifers, native tree to London, grows beautiful soft blue-green needles, and has many medicinal health benefits from boosting immune system, protecting against pathogens, and improving respiratory health.